Things have become extra exciting because of that little radio appearance I did last week. Remember, I was on "Performance Today." I like saying that. It sounds as if I am this great pianist! The deal was, I was on "Piano Puzzler." That is a segment of "Performance Today." You can click on that link to hear me. Although I still have not heard me. While I was on "Piano Puzzler" they generously let me talk about Leonard Pennario. One thing I said was, if people have any stories about Pennario they want to tell, please get in touch with me. No detail is too small! I think I said that. 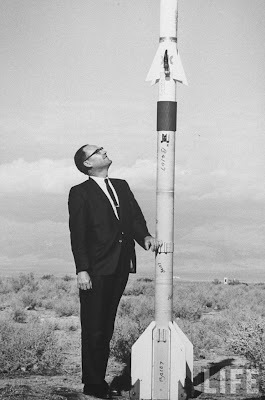 Yesterday morning I wound up on the phone with this physicist who had worked on the Sidewinder Missile. I will tell you one thing. I should be writing a book about the Sidewinder Missile. Because now I know everything about it! 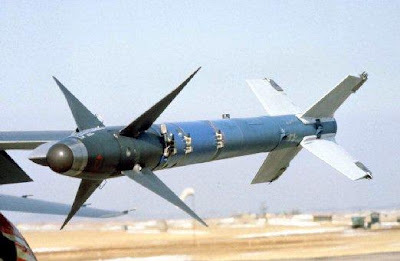 The Sidewinder Missile is not to be confused with the missal I take to church. Every time I write that word I have to make sure I am writing the right version. 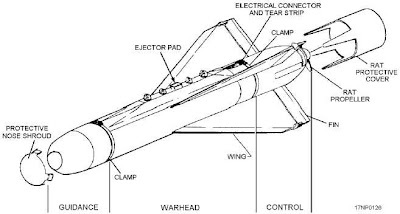 Here is a picture of the Sidewinder Missile. 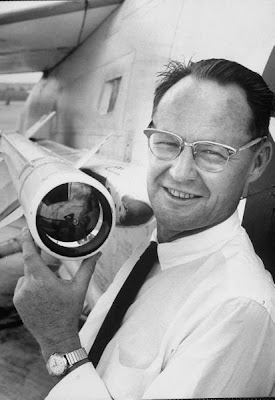 The physicist worked at China Lake, Calif., where the director of operations was named Dr. William McLean. That is he at the top of this post! And here is a portrait of Dr. McLean from Life magazine. Now I know all about Dr. McLean and his wife, I will have you know. But some things will have to wait for the book! That is the book I will be writing about the Sidewinder Missile when I am through with my book on Leonard Pennario and his and my places in history are both assured. The Sidewinder Missile anticipated its target and that is one thing that made it effective throughout the Cold War. That is what the physicist told me! Here is a picture of the Sidewinder Missile anticipating its target. The physicist's path crossed Pennario's when Pennario gave a concert in Pasadena which is near China Lake. Pennario was playing a recital there and she sent a message backstage to him at intermission asking him to play Ravel's "La Valse." That is a harrowing piece of music! It is one of the most difficult pieces a pianist can learn. Pianists today play it just to prove that they can. That is the kind of piece it is. But Pennario was Superman. You have to love how he dealt with the request. He came out on stage at the end of his recital, as the crowd was applauding. And he silenced the crowd. And he said from the stage he had received this request. He said, "This piece is a little longer than what I would normally play as an encore. But I was asked to play it. So I'll play it!" And he sat down and played "La Valse"! For this beautiful physicist! Did I mention what her name is? It is Gisela! That is a beautiful name. ... but still, she is preoccupied with thoughts of Leonard Pennario and the one time in her life when her path crossed his. That is the kind of artist he was! What a wonderful post! Haydn, eh? I missed it, lol. But I will say this. Only yesterday, I did listen to all four movements of the (London) Symphony No. 104 - New York Phil/Scott, lol. Hey Mary, it was great to hear you and you did a fine job, me lady! And Leonard plays La Valse so effortlessly... what a brilliant man he was! A slight correction, Mary: China Lake is nowhere near Pasadena, which only shows you how eager Gisela must have been to hear Leonard Pennario.